Contained within serenity, the word serendipity - a happy, accidental chance, or the luck of finding unsought pleasant or valuable things - somehow has a magical, ethereal quality. And indeed, there has to be something magical, something truly effortless, about those pleasant things which land, unbidden, in our laps from time to time. Yesterday, towards the end of a well-muffled walk, I had a moment of photographic serendipity. It was an icy-bright day, in which a brittle sun never quite managed to reach the crisp frost underfoot, and only a few, mostly dog walkers, were out along the canal. I had been round the Trap Grounds, and taken several photos: leaves frilled with sugary frost, and bare branches etched against a brilliant blue sky; trees dully reflected in ice, and the slanting sun turning grass and moss and melting frost to crystal and gold. Walking back, I stopped to observe a lone swan on the canal, placidly nibbling at the opposite bank. 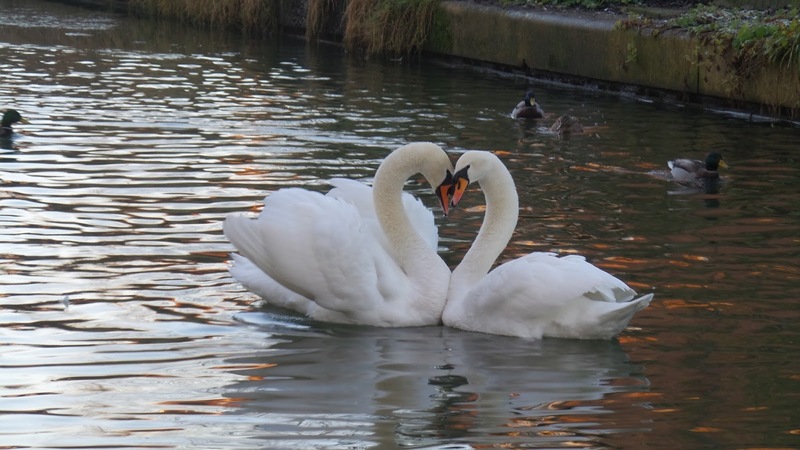 All through summer the canalside community has been keeping an eye on our resident swans, noting Mr Swan's injury and prolonged absence and Mrs Swan's admirable single parenting of her five cygnets. Instead of the weather, perfect strangers have discussed this family, swapping sightings and theories about missing swan whereabouts. In recent weeks I had seen unaccompanied cygnets - adult-sized but still mottled and brown beaked - but never a completely lone adult. She was not alone for long. I had already moved on several yards when a loud beating sound caught my attention; a male swan skimming the water, landing noisily then swimming about, his wings and plumage puffed up around him. Something made me turn back and pull out my camera. As I later discovered, the absent Mr Swan is believed to have returned to reclaim his mate - certainly, the swans clearly knew each other, and the hitherto lone swan showed no alarm, even when a hanger-on arrived a minute later. Ignoring him the two swans swam forward in greeting: they paused, and in a timeless courtship ritual stretched and arched their necks... and then, in a fleeting moment of tenderness, they touched beaks, their necks forming a perfect heart. An iconic moment, briefer than a wave; one universally captured in so many romantic images, memes and sculptures, now happening right before me. And I... I somehow clicked my camera at just that perfect moment, that perfect heart, before they separated and resumed their gliding around. I had taken a lot of lovely photos on that walk, of sunlight and frost and reflected light, but this... this was something special. This was a moment as fleeting as a dappled shadow, a "photo op" which could not be planned and waited for. This was serendipity: magical, unexpected, unearned, and all the more delightful for being that.